Look dressed up but still ultra-cool in Moss London's attention-grabbing tux. If you've got a black tie event, there's no need to reach for your black suit. 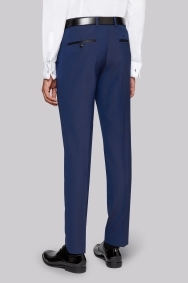 Be different and daring in deep blue with this option by Moss London. 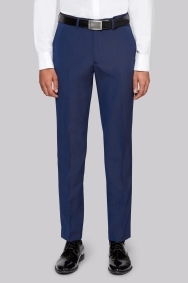 The trousers are a key player, and their slim fit cut creates a crisp outline with a tapered shape that sits close to your legs. Tick every box of the dress code by wearing the matching jacket, a crisp white shirt and black bow tie. The trousers are cut just above the shoe, so make sure you've got your best pair on and give them a good polish before you leave the house. Beautiful quality and just as described. I have tested your goods the best quality with normal price and exact size. Fabulous quality, very smart, and is true to size. Look very smart and the sizing is correct. Good product but returned it because the color was slightly different than expected.